As I look in the mirror the reflection of a woman full of promise, hope, standing in my own beauty. I am proud, feel a sense of peace, knowing I am a still a work in progress. Today I am standing in my own shoes. Why is it important I am standing in my own shoes? After a simple accident at home followed by three surgeries in as many years. I worked with wonderful therapists who helped me retrain my nerve and brain to work after a fall. I am left with questions that have no answers from some of the lasting effects of this accident. Which I find extremely frustrating. In my living room a single high heel black shoe with sequins trim between the seam of heel and the shoe. I found the picture at +Home Goods and Decor on my way home from one of the many occupational and, physical therapy sessions during three years of rehabilitation.The print is out of the ordinary for my decor but it doesn't matter because it is a symbol of my strength, courage and determination it took me to battle back. The words in in the print are all encouraging to rise above and strive for the best. 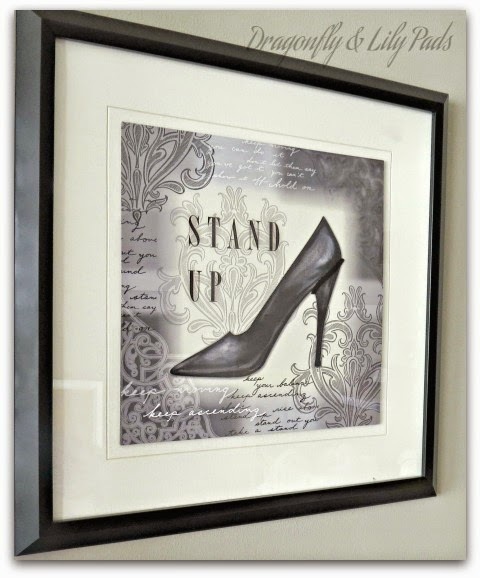 That day I purchased the picture of the shoe print as a symbol to stand up for myself. That moment (the accident) made a U-turn in the direction I had planned for my life. It left me feeling like I lost my sense of direction. That day I decided to take my direction back. When I face uncertainty that changes my direction I decide which path to take standing firmly in my shoes. No more regrets or uncertainty once I make the choice it is mine. I am moving forward, onward and upward on my path to claim my journey. Why did I tell you about choosing my path? It lead me here to this blog typing these words. I found a path I love using this keyboard share the creative magic that dances in my head. I have been stepping on this path for about 14 months. I feel like I am on the right journey, finding new tools, and seeking new information to share the best of me with you. This particular day I made a choice I did not like. 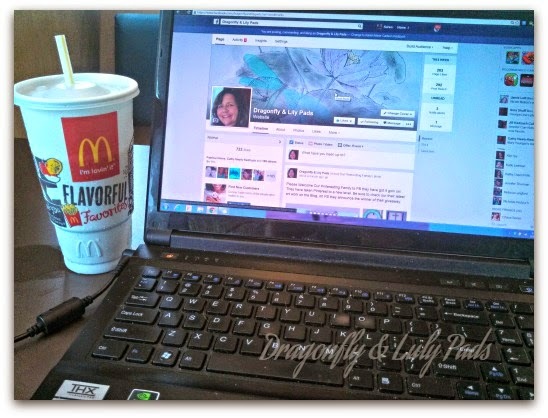 I spent a couple of hours of our Labor Day holiday at McDonald's because our Internet was out at the lake. I wanted to be home with my family. I had also promised to do a Round-up post with other bloggers but the time was not settled. I had to wait to schedule the post. No Internet meant I could not schedule. I kept my word linked my post and headed back. This weekend was one of four times our family spent a few days at the lake all together. We have owned the home for 3 years. This time is extremely precious to me. What is this print? 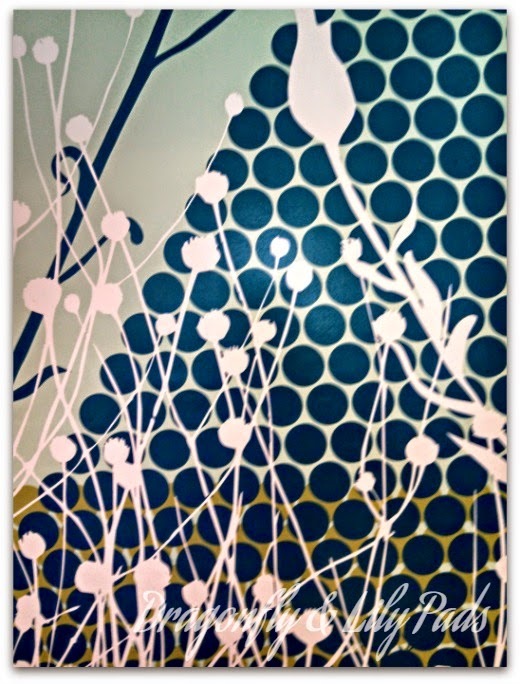 The wallpaper at McD's of course I find beauty in most everything. I am optimistic, silly, determined, giving, I see promise even in the opposite direction sometimes. My Mom declares that, "I live in Disney World" because I believe anything is possible. I lost my way back there after the fall losing some of the most valuable parts of me. As a little girl I wanted to grow-up (I am still working on that) be a teacher, wife and most of all a mommy. I am blessed to say those dreams have come true. Now that I am standing in my shoes. I am building a new dream, I am back, with the tap of an arrow (Publish). Click on Something New to see my first post. I have come a long way. When I pulled in the road this is what I found waiting for me. Three strong men, a beautiful girlfriend, and a wet dog. My family waited until I returned to put this sweet girl in the water for her maiden voyage as ours. 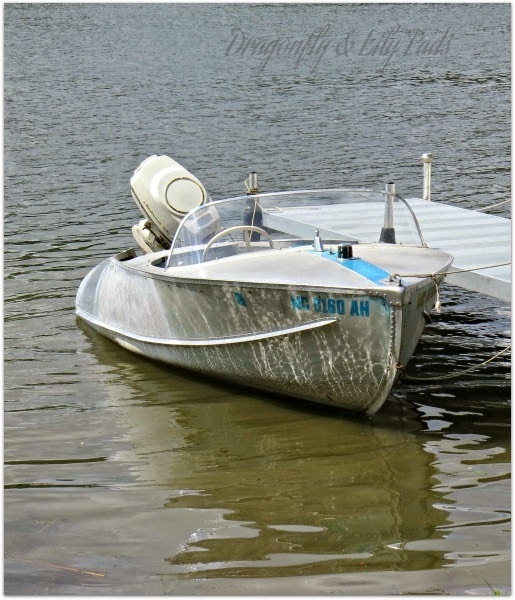 She is a 1959 Feather-light boat we bought from the neighbors a few weeks earlier. We are going to work on her as a family to restore her to her former glory. Tinker has a running motor which is steered by airplane cable attached to her dashboard and steering wheel. All of her cushions snap on, some of her blue paint has faded, which my husband wants to have repainted. She has a few leaks from sitting in their garage unused for years. She wears her age well don't you think? I will keep you posted as she transforms into her all her glory. I am proud of this path I chose standing in my shoes. I research, photograph, purchase and build most of the projects you have seen myself, or with help from family and friends. What is compelling me to do this Blog? You are because I feel like we inspire each other. You inspire me by continuing to challenge me to make this site the interesting, worth your time, and fun. I continue to learn new formats, styles, trends to make D&LP a place to come back to for information, tutorials, and ideas. My journey is to inspire you by sharing ways to create the transformation of your house into the home of your dreams. Join me as we all evolve through our personal journeys while standing in our shoes! Have you had a time in your life when you lost your direction? How did you find your path? Show a Girl a little Blog Love! Please leave a comment and tell me a little about you. I also would love to get to know you. I personally correspond to your comments. I like the shoe picture and what it stands for. Thank you for visiting. We all have a journey with up and downs. I am glad I found my footing and you liked the print. 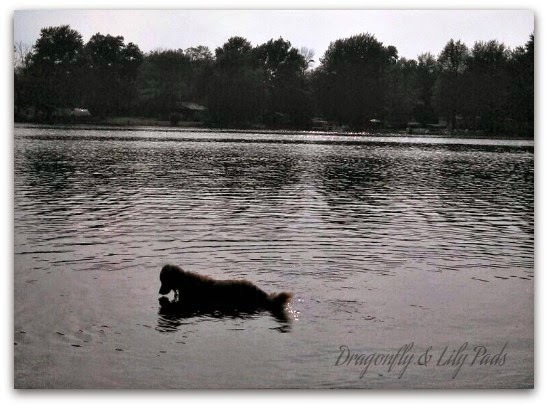 I am happy you have found a special place to share in blog land too. I am meeting and learning from so many people in the Blog world. How awesome is it that you can be yourself. This is such a beautiful post Karen. You and your picture inspire us all. What a beautiful photo and a great reason to buy it. Great post, Karen! Ah, finding and accepting the new normal can be frustrating. Training yourself to look forward and not back is not easy, but counting my blessings has been the key for me. Thank you so very much for sharing your heart, soul and journey. We appreciate how you seem to be discovering joy in everything that life has to offer. Congratulations to you as you recover and we "StandUp" to applaud you! Thank you for your kindness once again. This post took me a while to sort out but I am happy it has inspired you too. I am glad you are recovering from your surgery. You are so flattering you make me blush. I am so glad you enjoy the blog. Thank you. I am glad you liked the post. As you can imagine this was hard to get just right. I am so glad you stopped by to visit today. I knew you would understand. Thank you for taking the time. Stay strong my new friend. It will get better as we both look forward. Those are very wise words. I look forward to you creating again soon. Thank you for the applause. :) I am honored by your support as I discover all that I can share with the world through blogging. You made me smile and I will stand with you both any day. Thank you for the encouraging words. I have some lasting effects of my injury but I have learned to work around them.